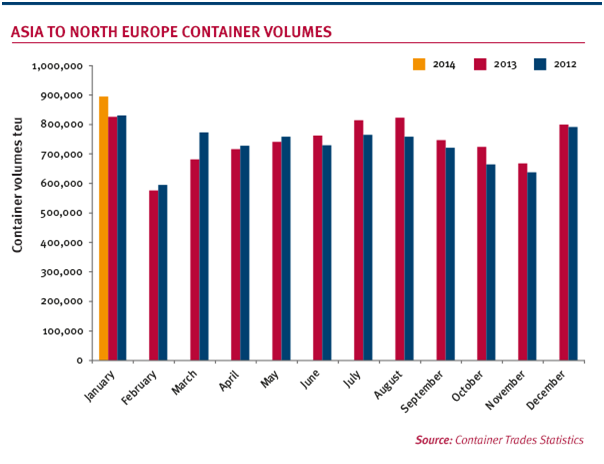 THE Asia-Europe trade lane has started the year strongly with volumes increasing by more than 8% on-year in January, according to Container Trades Statistics, which reports that carriers handled 1.4m teu in January, up from 1.3m teu a year earlier. The on-year increase is the largest seen on the trade lane since August, when volumes leapt by more than 10%. It is also the largest amount of containers transported on the trade lane in a single month during the last three years, when CTS began providing data to Containerisation International. January tends to be the strongest month of the year as shippers rush to move cargo ahead of factory closures for the Chinese new year. Broken down into the three subsectors that make up the overall Asia-Europe trade lane, services on vessels sailing from Asia to north Europe, the largest of the three trades, recorded an 8.1% on-year increase in volumes in January to 895,092 teu. The Asia to the western Mediterranean and North Africa trade lane improved most, volumes leaping 11% on-year to 258,486 teu. However, volumes still lag behind 2011 levels, before the Arab Spring-related turmoil affected the region. The final segment, Asia to the eastern Mediterranean and Black Sea, saw volumes increase 6.7% on-year to 267,552 teu. Although the improved volumes are good news for carriers, it should also be noted that this year Chinese new year fell on January 31 this year, earlier than in 2013, when the event fell on February 10. The rush to get products on to ships before the factory closures will therefore have been slightly earlier than last year, which means growth levels may be slightly weaker in February.